Bolle 11441 11441 Parole Red - TNS Gun Sunglasses FREE SHIPPING! 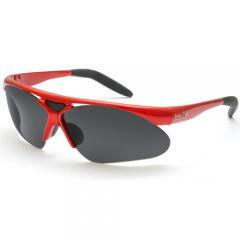 The striking Parole Red - TNS Gun Sunglasses from Bolle are designed for high performance. The lightweight frames include non-slip temple and nosepieces, perfect for active wear. The semi-rimless design maximizes field of vision. The Parole comes with a set of TNS Gun grey lenses with silver mirroring, or can be fitted with the Bolle Optics Control System, allowing for ultimate versatility to match the changing needs and conditions. Lenses are crafted from advanced B-20.3 polycarbonate resin, twenty times more impact-resistant than glass at a third of the weight. The lens incorporates a Carbo Glass scratch-resistant armor coating on each side, as well as anti-reflective, anti-fog and hydro-oleophobic treatments for ultimate clarity outdoors. Bolle's frames come with a cleaning cloth and carrying case for safe storage. ©2002-2019 CopsPlus.com: Bolle 11441 11441 Parole Red - TNS Gun Sunglasses FREE SHIPPING!